Maybach was famous for their really luxury cars. They were built from 1921 to 1941. The new owner Daimler built from 2002 to 2012 the Maybach 57 and Maybach 62 models. 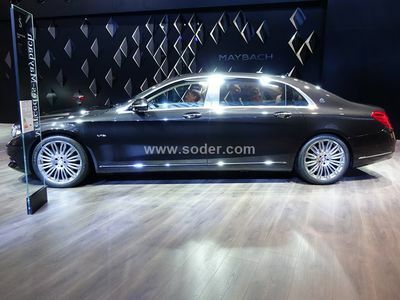 For the year 2015 it is planned to build the new S 600 Maybach. In February 2015 the delivery of the new S 600 Maybach will start. The XXL version of the S-Class is 5.45 meters long. These extra 20 centimeters are installed between the B- and C-pillar. So there is enough space to equip the Mercedes-Maybach with two executive seats in the fond which are really comfortably. For the executive seats, the maximum backrest angle is 43.5 degrees. So it is even possible to sleep really great on board. The S 600 Maybach (internal code X222) is the quietest car of the world and the interior is equipped with the finest Nappa leather. The S 600 Maybach is powered by the 6.0 liters V12 BiTurbo engine with 530 hp and 830 Nm of torque. The engine is combined with the 7G-Tronic Plus automatic transmission. The S 600 Maybach hits 100 kph after just 5.0 seconds. There is also a V8 model. The S 500 Maybach delivers 455 hp and 700 Nm of torque. The 4.6 liters V8-BiTurbo only needs 8.9 liters fuel on 100 km and accelerates to 100 kph also in 5.0s. This powertrain is combined with the new 9G-Tronic automatic transmission. There will be also an all-wheel-drive version 4matic of the S 500 Maybach. It debuts in June 2015.